I am looking for a chalet holiday for five adults and three children, a 2 year old, a 7 year old and a 14 year old. Only four of the adults are skiing. I would like a smallish chalet, close to slopes and amenities (for non-skier), catered with an outside jacuzzi, not a massive slog from the drop off point and a shortish transfer time from airport. Can flights be included? Equipment hire and lift passes? Ideally capable of having a 2 year old being over excited, close to ski school as well. Chalet Lievre Blanc in Montchavin La Plagne sleeps 12 and is priced at £10790 for sole occupancy. It is literally next door to the ski lift to Les Coches and opposite Evolution 2 school and equipment hire shop. You cannot get any closer. The chalet features a private rooftop hot tub, free Wi-Fi, log fire, Sat TV, heated boot area, open living space with spectacular views over the valley, private underground parking, breakfast, afternoon tea and four course meal with complimentary wine served throughout dinner. Sister Chalet Hermine is next door for £8400. Sporting an outdoor sauna instead of a hot tub, it has everything Lievre Blanc features above. We offer discounted ski lift passes and equipment hire and can assist with transfers, child care and ski lessons if required. I hope this all sounds tempting. Please do not hesitate to contact us if you have any further questions at bookings@skihiver.co.uk or 07752151500. Ski Chalet Mont Blanc an owner run newly renovated 17c farm would be a great place for your group. Our stunning Chalet with hot tub has six ensuite bedrooms and large open plan living area, contemporary woodburner and amazing views from the balconies. The mezzanine snug has satellite TV, DVD and games. St Gervais is France’s best kept secret and at just over an hour from Geneva and with 440km of piste is the third largest ski area in France and a great place for all skiing levels, we drive you to a different telecabine within the Evasion Mont Blanc each day, the main Telecabine and town of St Gervais are only 5minutes away. Bettex and the ski school 10 mins, Megeve, Les Contamines, and Combloux are just 10minute drive away. We can also arrange an experienced local guide for something a little more adventurous, maybe Ski the famous Vallee Blanche! In house massages or why not book a fun and hugely informative wine tasting evening with our Sommelier! Delicious home made breakfast including freshly baked bread as well as local bread and croissants, home made jams and marmalades, cereals, energy pancakes, yoghurts, fruit and a cooked option each morning. Four course evening meal using fresh local ingredients accompanied by our house wines selected by our sommelier. New Year’s Eve includes a gourmet seven course champagne tasting menu! I’ll be delighted to welcome you from 28/29 December for 7 nights. •	2 minutes from lifts in free ski bus which stops 50m from the chalet and also goes to the village. The price for sole occupancy is €9,840 held at this season's rates. If you have any questions, please email info@chaletmariestuart.com or telephone (UK) 0131 552 5991 and we'll be happy to help. Hotel Au Coin du Feu is a full service hotel with a chalet style atmosphere. Our 17 unique bedrooms are perfect for couples and families alike. We have an on–site crèche, a games/movie room for teenagers, a hot-tub, sauna, massage room, private bar and five course evening meals for adults. All our rooms can be booked for seven nights half board or for short breaks. All of our chalets are fully catered - 6 days a week, including a continental breakfast with a hot option, afternoon tea and a 3 course evening meal. Most of our chalets have hot tubs, and some also have saunas and a relaxing wellness area. Our beautifully appointed chalets can accommodate from 6 - 30 guests and include free airport transfers. We will organize your ski passes which will be delivered to your chalet upon arrival, meaning no queuing in busy ski pass offices and more time on the mountain. We look forward to hearing from you soon !! 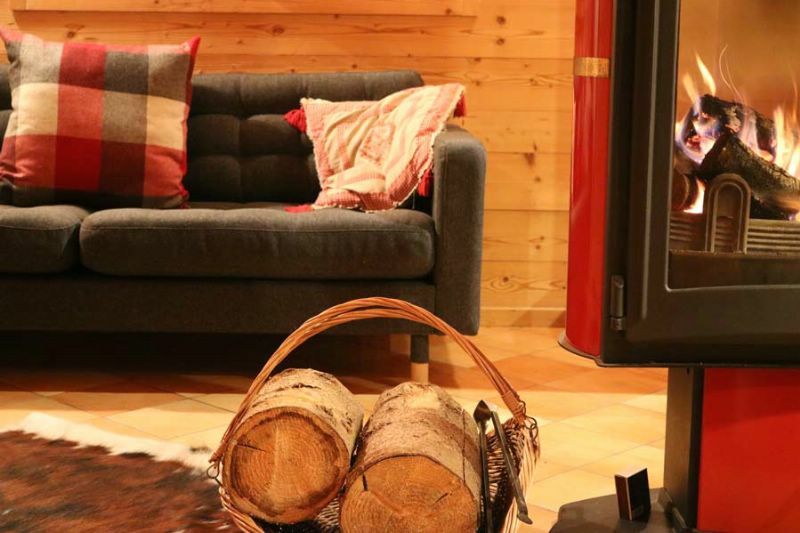 Hopefully we can help...chalet Hibou ticks all your boxes - it has a sauna rather than a hot tub but it's central Morzine, moments from ski school and the perfect size for your group. Chalet Hibou sleeps 8- 10 guests in 4 en suite bedrooms and sits in the heart of the tourist office square, just moments from both the Pleney telecabines and also the Super Morzine bubble. It has a large open plan living and dining area which leads to its own private balcony which has fantastic views of the surrounding mountains, it also has a sauna to help ease those aching muscles. •	Breakfast daily: continental buffet consisting of: croissants, pain, cereals, fruit juice, yoghurts, fresh fruit and tea, infusions and coffee. 6 mornings your chalet hosts will also offer you a daily cooked special. •	Afternoon tea and freshly baked cakes daily. •	Aperitifs and canapes, 6 nights. •	Evening dinner 6 nights. (we offer a 3 course evening meal & cheeseboard on 5 nights and then the 6th evening we offer a Speciality Savoyard evening). Superior complimentary wine, tea and coffee is served on all 6 evenings. •	Hotel clean of bathroom 5 mornings plus mid week towel change. •	Excellent quality ski hire at partner ski shops with great discounts for our guests. We have some amazing chalets in great locations for you. We are also offering a 10% off discount if you book by the end of March and pay the rest of the balance by 31st August. Situated at the foot of the piste in La Plagne Montchavin, this chalet can sleep up to 11 people. You can relax out on the balcony in the private hot tub too! Located just a short walk from the gondola lift, piste and village centre, this chalet is great for a group of 8. You have your own private hot tub too! One of the chalets offered above boasts our premium service. Enjoy little extras such as an upgraded catering service with additional food and drink and upgraded chalet interiors for a more comfortable stay. Will-i-ski? is an independent owner run chalet company dedicated to bringing you a unique holiday you will not forget. We (Phoebe and Charlie) currently run the Chalet Marmotte in La Plagne 1800 and feel the chalet can deliver everything you require for a traditional and cosy chalet holiday. The Chalet Marmotte sleeps up to 15 people in various room configurations. There is a lounge/dining area with a log fireplace and a separate ‘snug’ with games console and a TV for watching DVD’s. We also have a Sauna to help soothe the muscles after a long days skiing. • WIFI and a Television with DVD player and games console. • A private driveway for parking if you choose to self-drive. Price - £849 per adult / £799 per child under 12 and £100 per infant for a week from the 28th December 2019! The price for the accommodation is £8792 for the whole chalet, There are no other annoying hidden extras that you may find when booking with others. 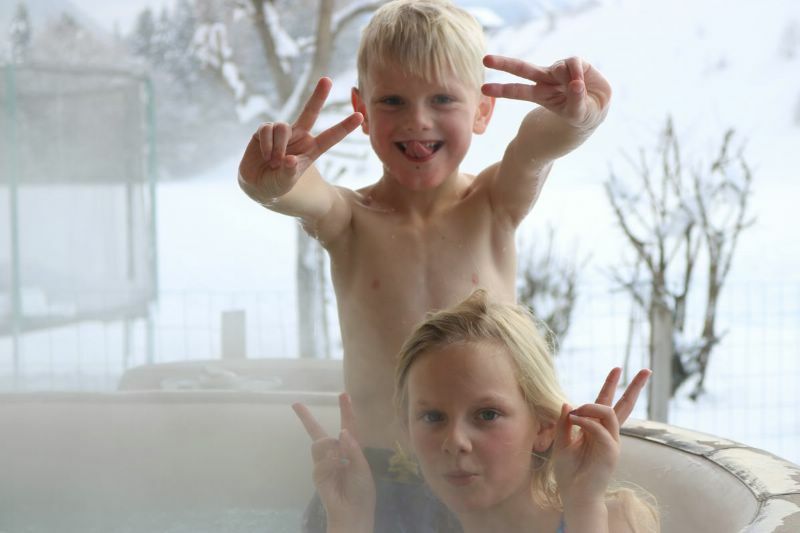 Skibug offers great value, high altitude chalet holidays – giving you all the excellent service you'd expect from a posh skiing holiday, with a lower price-tag & a down-to-earth attitude. We welcome you to spend your ski holiday with Alpine Action Adventures next year. My husband and I have run Alpine Action Adventures for the last 6 years and we have had nothing but 5 star reviews from our guests. We provide a place that feels like home with all the special treats you expect from a ski holiday. The Chalet - comfortable and cozy with warm beds, wood burning fire, bathrobes and fluffy towels, slippers, wifi and British TV. We can advise on a creche or a nanny service in the chalet for your 2 year old. The region - The Portes Du Soleil is just 55km from Geneva airport with 630km of skiing across French and Swiss resorts. The Portes Du Soleil offers excellent skiing/boarding for all abilities with beautiful tree line runs and great unpisted areas to explore. We can advise on the best places for kids to experience skiing for the first time and all you ski ninjas out there! Food - Six nights of delicious 4 courses with canapes and drinks to start and all your wine, beer and bubbly is on us during dinner. Breakfasts are extensive with all the family favourites to set you up for the day. When you return each day there will be afternoon tea & cakes and we can offer early dinner for kids. The price for sole occupancy for the week is 7000€ (c.£6050) with a 20% deposit to hold your booking. This does not include equipment etc. but we can help you get all the extras sorted! Message to sort the details. 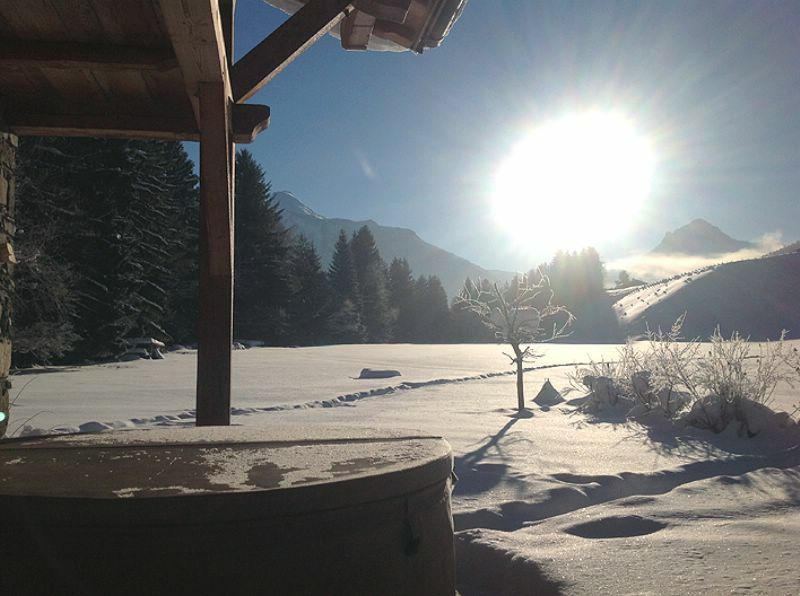 We have availability at Chalet Lucioles, our beautifully renovated, luxurious chalet right in the heart of Morzine. The chalet enjoys a great location just opposite the main ski lifts and pistes, with numerous great ski schools, bars, restaurants, shops and amenities within a 1 or 2 minute walk. Have a look at our website www.alpine-adventure.co.uk for further details and contact us if you would like any other information.